This is a rare case of persistent Horner's syndrome following epidural anesthesia and Caesarean section. A 33-year-old female presented with persistent ptosis and miosis following epidural anesthesia and Caesarian section several months prior. Magnetic resonance imaging (MRI)/magnetic resonance angiography (MRA) of head, neck, and chest were unremarkable. Medline search using terms Horner's, epidural, spinal anesthesia, delivery, childbirth, Caesarian, and pregnancy identified 31 articles describing Horner's syndrome in obstetric epidural anesthesia, of which 11 were following Caesarean section. The increased incidence of Horner's syndrome in the setting of epidural anesthesia in pregnancy may be related to epidural venous engorgement and cephalic spread of the local anaesthetic, with disruption in the oculosympathetic pathway. It is important to include recent epidural anesthesia within the differential diagnosis of acute Horner's syndrome in a postpartum female. Rarely, the ptosis may be permanent and require surgical intervention. Horner's syndrome, characterized by upper eyelid ptosis, miotic pupil, anhydrosis, and ipsilateral facial flushing, secondary to sympathetic pathway disruption, is an important differential diagnosis in unilateral ptosis. Epidural anesthesia is widely used for pain relief during childbirth. The incidence of Horner's syndrome is rare with epidural anesthesia but increases to 0.4-2.5% in the setting of childbirth and to 4% in Caesarean sections. This association has been commonly reported as transient in nature in the anesthesiology, obstetric, and neurologic literature. We report a case of persistent unilateral Horner's syndrome in a healthy female following epidural anesthesia and Caesarean section. A Medline literature search was performed using the following terms: Horner's syndrome, epidural, spinal anesthesia, delivery, childbirth, caesarean, and pregnancy. One hundred and six articles containing these terms were identified. Of these, 31 articles described Horner's syndrome occurring in obstetrics epidural anesthesia, and only 11 were following Caesarean section. The remaining cases were described in the setting of normal labor, early labor pain, and forceps delivery. Only one article describing Horner's syndrome during normal labor was published in the ophthalmology literature. All of the other articles were found in the anesthesia, obstetrics, and neurology journals. A healthy 33-year-old primigravida presented with persistent droopy right eyelid following Caesarean section 9 weeks prior. During a difficult labor, an epidural block (fentanyl 2 mcg/ml, bupivicaine 0.125%) was administered in the sitting position, with immediate right-sided back pain. She did not recline to either side. Eight hours later, she underwent Caesarean section in a dorsal supine and leftward tilt position. 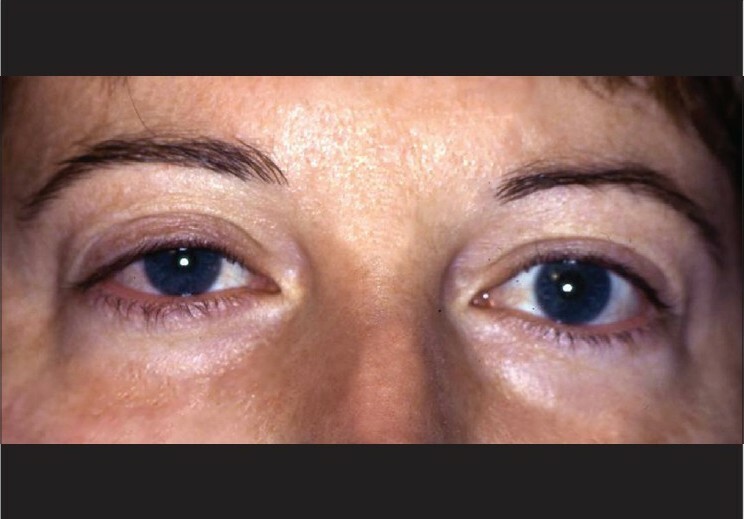 The ptotic eyelid was noticed postoperatively, approximately 12 h following the administration of the initial epidural, although its exact onset following epidural anesthesia was not known by the patient. The precise onset of ptosis was difficult to determine as the patient was given the spinal anesthesia while in labor and grimacing with contractions. Within 2 h, she was urgently taken to the operating room for Ceasarian section. Following surgery, she slept for several hours, and only when she awoke did a nurse comment on the droopy eyelid. Throughout the time of labor, surgery, and postoperative recovery, there was no mirror at the bedside for her to notice the onset herself. Neurological exam and other cranial nerves were normal. The diagnosis of right Horner's syndrome was also confirmed by the Neurology service. There was no history of anhidrosis and no sensory loss, facial numbness, neck pain, swelling, history of brachial trauma, diplopia, or diurnal variation was reported. Examination revealed a right upper eyelid ptosis of 1 mm (marginal reflex distance [MRD 1 ]: right eye - 4.5 mm, left eye - 5.5 mm) and a miotic pupil prominent in both light and dark illumination [Figure 1]. The installation of 2% cocaine showed no pupillary response on the affected right side. Hertel exophthalmometry revealed 2 mm of proptosis on the same side. Levator function, motility, thyroid levels, and magnetic resonance imaging (MRI)/magnetic resonance angiography (MRA) of the head, neck, and chest were normal without masses. At a subsequent follow-up 8.5 months later, the ptosis was unchanged. Surgery was offered but declined at this time by the patient. This case differs slightly from previous reports due to its delayed onset, laterality to the elevated rather than dependent side, mild proptosis, and persistent duration of over 8 months. The exact pathophysiology is unclear, but this case demonstrates that a persistent Horner's syndrome may occur in the absence of any systemic associations and complications following epidural anesthesia for Caesarean section. This uncommon presentation of Horner's syndrome following Caesarean section and epidural anesthesia, although reported in the anesthesiology and obstetric literature, is relatively unknown within the ophthalmic literature. Only one article was published in 1995  in the ophthalmology literature documenting Horner's syndrome, but during normal labor and delivery. Although the majority of the literature describes a transient phenomenon, rarely it may persist and require consideration of surgical intervention for ptosis. This highlights the need to include recent epidural anesthesia within the differential diagnosis of acute Horner's syndrome in a postpartum female. It also suggests the need to monitor the patient for autonomic complications postinjection due to possible high-level sympathetic blockade. Clayton KC. The incidence of Horner's syndrome during lumbar extradural for elective Caesarean section and provision of analgesia during labour. Anaesthesia 1983;38:583-5. Jeret JS, Mazurek AA. Acute postpartum Horner's syndrome due to epidural anesthesia. Arch Ophthalmol 1995;113:560. Biousse V, Guevara RA, Newmann NJ. Transient Horner's syndrome after lumbar epidural anesthesia. Neurology 1998;51:1473-5. Lynch JH, Keneally RJ, Hustead TR. Horner's syndrome and trigeminal nerve palsy following epidural analgesia for labor. J Am Board Fam Med 2006;19:521-3. Chandrasekhar S, Peterfreund RA. Horner's syndrome following very low concentration bupivacaine infusion for labor epidural analgesia. J Clin Anesth 2003;15:217-9. Hered RW, Cummings RJ, Helffrich R. Persistent Horner's syndrome after spinal fusion and epidural analgesia: A case report. Spine 1998;23:387-90. Hertz R, Chiovari CA, Marx GF. Delayed Horner's syndrome following obstetric extradural block. Anesth Analg 1980;59:299-300.